Our next model, the highly exclusive CIÉ/Irish Rail 24850-24854 series ballast plough van, is now available to pre-order ahead of delivery in August 2018! Five of the CIÉ/Irish Rail 24850-24854 series vans were introduced in 1978 to supersede elderly pre-grouping vans for the Civil Engineering Department. They usually ran in pairs, top-and-tailing ballast hopper trains across the Irish railway network until their withdrawal in 2013. 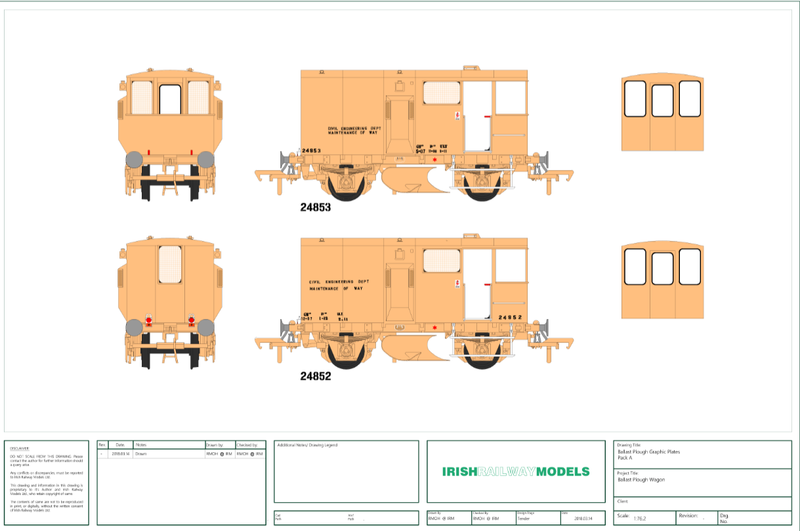 Following the success of our first model, the CIÉ/Irish Rail Ballast Hopper wagons, it seemed fitting to add the Ballast Plough to our range to complete a typical Irish ballast train. The model will utilise the same chassis as the ballast hopper and cement bubbles as per prototype, and will include features such as fully detailed interior, wire mesh on the windows (where appropriate) and full DCC control of interior and tail lights via a two function 8 pin decoder (not supplied). The vans will also feature switches to operate these features on analogue systems. The Plough Vans will be made in a strictly limited production run. Four of the five vans will be represented in this batch of releases, with the vans coming in two packs of two for a sale price of €119.95. This price reflects the very small production volume and complexity of the model. 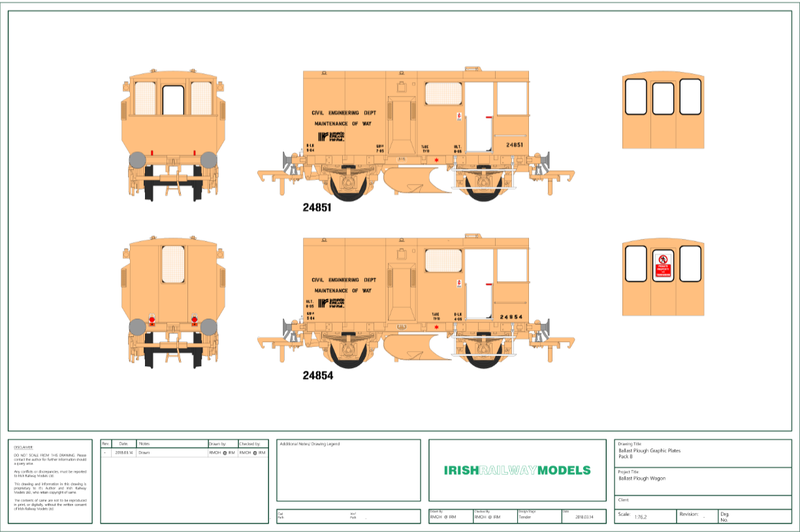 There will be an IR and IE pack, both carrying CIÉ/Irish Rail ‘Machinery Yellow’ as per prototype. The IR pack will feature two vans with the IR ‘points’ logo, gained in the late 1980’s and observed on some plough vans as late as 2006. The second will be in IE livery, which represents the final years of these unique vans. They're up but marked as sold out. Thought IRM were doing these in CIE initial livery with CIE logo and no window bars. 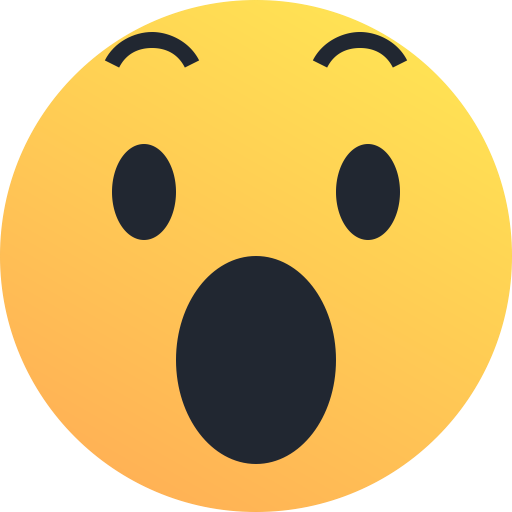 Might need a 'deep' refresh (hold shift key down) to clear your cache. Pre-orders on the plough are now open! It works ok if you are logged into your IRM account. Just successfully ordered. But the link above won't work unless logged into IRMs shop site. Which should force a reload. Hi Noel, we may do them at a later date but these vans fit with the era of our ballast hopper release so it made sense to do these liveries to compliment them. Sorry for the few technical gremlins this morning folks, all sorted now and the orders for both packs are flying in! Damn, Was hoping to give the Visa a rest this month. better order 1 pair I spose. Can't wait to see pre production samples. Also some serious weathering to be going on with these, they were in some state like they had a fight with a JCB towards the end. Good to see will splash the cash tonight. A class model again from the boys ! Agree these look stunning. I don't like modern yellow stuff but will make an exception because these look absolutely exquisite and will go nicely with the ballasts. I hope to weather the yellow almost out of sight to a grimy brownish look. I presume the NEM pockets will be at the same height as the Ballasts which should make kadee hookup easy. Will only need an adjusted height on the rear of the lead plough to hook up to a loco via kadee. Request please lads re the interior lighting, 'warm white' please rather than 'cool white' (alias blue tint), and not too bright. Some of the MM loco cab lights seem as bright and blue as arc welding torches. Well done lads these look a stunning prospect. Correct Noel, this utilises the Bubble / Ballast chassis. No Noel, for DCC control it will need a decoder. The switch is for DC use. Thanks. Ok I mistakenly thought decoders might just be needed for DCC switching rather than power. Ouch - two €25 decoders needed in addition then! Is there a CAD drawing showing where the decoders would be installed, and if there will be an 8 or 21 pin socket? Would a function only decoder such as the ESU LokPilot Fx V4 suit? You can get two function decoders for a lot less than 25 euro if you know where to look. We will have chips to recommend in the coming weeks. They will be 8 pin and installed inside the van. Sorry lads but do these have to be paid for now? Or is it a reserve job. I have added varnish and nail varnish to LEDs to mute output on N gauge models - where overscale lighting is a real problem. Certainly on Dapol signals you can yellow down the LED to an oil lamp colour and brightness. I can see many pairs being sold before plastic moulded and then subject to a great dirtying up fest, certainly mine will get an oily and rust washing - some great pics on the web so thanks to all concerned. I know, I know, boring uniform modern era mk2 sets invaded the layout a few weeks ago, now going to permit yellow contamination, where will it all end Ted? 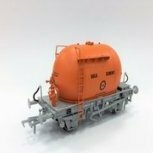 And it gets worse - bogie infestation - never seen a real Tara in my life, they mean nothing to me, some sort of a broach is all I remember from school, but they make super cute looking models so may be the only bogie freight wagons I ever permit. And at least they are nice and short. Honestly I have no autoballasters and never will, as Fr Sheamus Fitzpatrick might say about allied war memorabilia "that sort of thing wouldn't interest me at all at all"
There is on/off capability with DCC chip, but if you do not fit one the lighting will be on as a constant. So strictly you do not need to fit a DCC chip to have lights on with DCC, but you will have control if you fit a chip. Hi Craven, yes if you order now it’s payment up front as it’s how our web system works. You can of course run the risk of waiting for them to be released and hope they don’t sell out before release. No worries, thats great. Thanks Fran. Looking forward to these. I've been to the doctor, Noel. There's good news - if you have an infestation of bogies, the antidote is a pair of filthy J15s and a green "C" class. They'll shunt them into a shed, allowing proper four-wheeled goods stock to take their place. Phew, thanks @jhb171achill. Lucky for me one J15 and one green "C" class are already being prepared in the apothecaries bottle. There may be hope for a 'bogie' cure yet, but I am still concerned about 'yellow' fever. Order placed. Hope they are as good as the hoppers. Ordered mine and can't wait. It is extraordinary that a wagon which so few of were built will be recreated in model form. Reasonable price as well when you factor in the specs and small numbers being produced. An all round winner. It was a good call. Nearly every customer who bought a rake of ballasts should be a prospect for a pair of these so you know the numbers. You've even convinced me despite my 'yellow fever' paranoia. I'm sure these will sell out quickly once all your existing ballast customers find out about them.
. You've even convinced me despite my 'yellow fever' paranoia. There is a pic on Google of one of these vans in all over brown with dirt. Only the parts that need to be read for numbers are yellow.